Loblolly Lane is a company that began over 15 years ago with Eunice and Emily, two South Carolina girls who met while attending The University of Georgia and eventually became business partners. The two create and design skirts and tunics for women, skirts and dresses for girls, and beautiful jewelry, all sold at their website - loblollylane.com or at design events. I think it's so cool that two college friends could use their talents to start a business and create such cute products together. Their selection of jewelry is so beautiful, and I was lucky enough to get to try a piece from their new Fall collection for review! 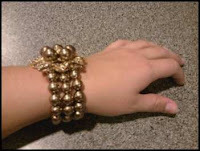 I chose the beautiful Brown Pearls Floral Bracelet, which is a wonderful bracelet with three stretchy strands of brown (goldish) pearls and a large metal and crystal flower on top with pearl accents. The bracelet is so easy to wear and adds a fancy touch to my look. I think it's especially great for this time of year with the holidays coming up and fall gatherings - it is a great accessory to "spice" up any outfit! I am very impressed with the quality and durability of the Brown Pearls Floral Bracelet as well. It is beautiful and well-made. I love wearing it because it's so fun and fancy. And it's only $11.99 from Loblolly Lane, which is an amazing price for such a detailed piece of jewelry. And if you're wondering where the name "Loblolly Lane" came from like I was, here is the answer: "Fond childhood memories live on Loblolly Lane, which is in Greenville, S.C. And yes, the Loblolly is a pine tree specifically found in the southeast." I thought that was interesting! I'm really happy with my bracelet from Loblolly Lane and would recommend their designs to anyone looking for unique fashions at a great price. 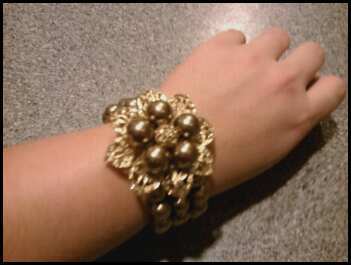 Buy It: You can purchase this bracelet for $11.99 and other jewelry on Loblolly Lane. Contest Details: Giveaway will end on Tuesday, October 26 at 11:59 pm (CT). Open to US residents. Winner will be drawn via number generator Random.org. Winner will be contacted by email and will have 48 hours to reply. I follower Cheapskate on GFC! And I tweeted about the giveaway too! Now following Loblolly on FB! Very cute bracelet and looks perfect for the Fall season! chitownchica is following loblolly on twitter.